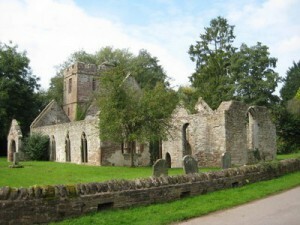 St. John the Baptist was the original 13th century church in Llanwarne, and was owned by the monastery of Llantony. It was built low down in the village and suffered constant flooding from the Gamber brook, despite which it was added to during the 14th, 15th and 16th centuries but by 1864 the decision was made to abandon it and the new Church was built on much higher ground. By the looks of the ruins, it was vast – but when we visited the problem with flooding was very apparent. The article went on to say that the old church was built on virtually the very lowest bit of ground in the whole parish, and because a hefty stream ran alongside, digging graves was almost impossible as water filled the holes as fast as they were dug. Also, when opening old graves to add to them, the coffins had to be weighted to stop them from floating. The floor of the church was raised on numerous occasions, until the doorway was so low that it was almost ridiculous, and there were other damp related problems.